For any communication between your Sharp phone and your PC, e.g. use of rootkits, you need the Sharp ADB drivers. The latest version of the driver package can be downloaded here: http://k-tai.sharp.co.jp/support/developers/driver/index.html – UPDATED 28.02.2019! Unpack the downloaded archive somewhere on your PC. Connect your phone to the PC using a USB cable. You can let Windows install any generic drivers it finds but you will then update them to the Sharp ones. 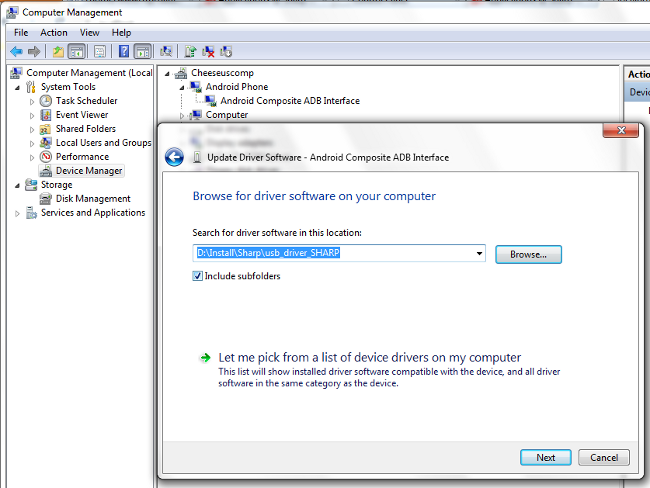 Go to Device Manager: Start > right click Computer and select Manage > click on Device Manager in the new window. You will see 'Android Phone' in the main window list. Double click on it or single click the expand arrow. You will see a sub-item called 'Android Composite ADB Interface'. Right click on it and select 'Update Driver Software'. Choose 'Browse My Computer for driver software' and browse to the folder into which you unpacked the downloaded Sharp driver. Hi there, Might be a noob question, but I followed all steps, and cannot find ADB.EXE nowhere. Can you please assist? These are the ADB drivers for Sharp. You need to download the ADB environment files separately. Just seach Google for "adb files", there are posts on XDA and many oother places. So, you need: 1. ADB environment files, 2. Sharp ADB files, 3. Whatever rootkit files you need (most rootkits contain the ADB environment files already). hi there how can i remove the patern on my docomo mobile sh-01f to many atemp pattern thanks?